Study Makes Case for Late Bloomers A big brain won't make you smart. But a flexible one might. A study in this week's issue of Nature shows that the smartest children have brains that develop later and change more dramatically over time. It usually makes parents proud when their children reach a developmental milestone ahead of other kids. But when it comes to intelligence, researchers say, the smartest children appear to have brains that develop later. Researchers at the National Institutes of Health (NIH) have been tracking brain development in several hundred children since the 1980s. The children get an MRI scan every few years and computers analyze the results. One goal is to find a link between specific changes in the brain and intelligence -- at least the kind that can be measured. 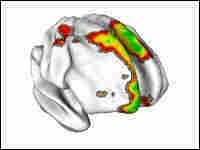 So a group of researchers has been studying the cortex, or gray matter that makes up the brain's outer layer. This is where so-called high-level thinking takes place. Dr. Judith Rapoport says they expected to find evidence that a thicker cortex meant a higher IQ. But they didn't. "When we looked at the very youngest group, the 4- to 8-year-olds, it was confusing," she says. "It looked like it was telling you that thinner brains had higher IQ." To figure out what was going on, the team looked at how the scans changed as these children grew up. Rapoport says they divided the children into three groups, according to intelligence. "The very, very brightest third had a later development of their cortex," she says, "so that at the earlier ages they hadn't started really growing to their peak amount yet." The cortex in these children started thinner but grew faster and for a longer time. By about age 11 it was actually thicker than the cortex of less intelligent children. Rapoport says the results, which appear in this week's issue of the journal Nature, challenge an assumption made by many parents. "People are usually pre-occupied with everything happening earlier, and being able to do things in a precocious way," Rapoport says. "This suggests that there could be some very clear advantages to things happening later." She says one advantage is that if the brain keeps growing into adolescence, it can be shaped in response to more complicated experiences and ideas. The research does not settle another concern many parents have: the link between intelligence and genes. Richard Passingham is a neuroscientist at Oxford University in the United Kingdom. He says it would be easy to look at this study and conclude that intelligence is predetermined by how your brain grows. "You might naively just think, 'Oh, that must be because there are differences in the genes compared with those of lesser intelligence,'" he says. Passingham says he doesn't want parents to see this study and think: "Oh dear, it's all the brain, therefore there's nothing as parents we can do about it." Genes aren't the only explanation for smart kids, he says. "It's possible that those with superior intelligence live in families in which there are also people with superior intelligence, and thus there is a richer linguistic and social environment." Passingham says intelligence depends on the right mix of nature and nurture. Genes might determine whether a child's brain develops later. But that won't make the child smarter unless the brain also gets the right kind of stimulation. During childhood, Passingham says, every experience helps shape the brain and determine its abilities. He says the study makes a case for paying more attention to a child's surroundings, not less. "What you would do is advise teachers, parents and everyone else to produce as stimulating a social and linguistic environment as possible," he says. That can be especially difficult for children who are extremely intelligent. Studies suggest that talented and gifted kids are more likely to drop out of school because of boredom.